Individual Favors Present your guests with their own chocolate favors. We offer a variety of options including two and four piece favor boxes in a range of colors. Customize your boxes with names, dates, or personalized greetings (this typically takes 2-4 weeks). Additional favor choices include shapes, lollipops, and chocolates in cellophane bags with bows and tags. Call us for more information or to place a custom order. Payments for custom orders are due at the time of order and are non-refundable. Dessert Chocolates Design your own favors, serve dessert chocolates, or garnish other sweets with Chesapeake Chocolates. Select delicious chocolates from our Menu to end an elegant meal. Special Events and Holidays We mold chocolates in all shapes and sizes. Baby carriages for a shower, hearts for an anniversary, or turkeys for Thanksgiving add a festive touch to a dessert platter and make delicious gifts. Call us for more ideas for your special event! 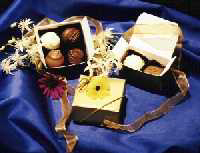 Impress your business clients or recognize hardworking employees with delicious handmade Chesapeake Chocolates. Choose any of our popular offerings and customize your gift selections with boxes or tags with your business logo or greeting. Consider additional packaging ideas to promote your event or business. We fill coffee mugs, tins and more with delicious treats. In addition, we offer a variety of chocolate shapes for your industry event. Chocolate houses, hardhats, and laptops are just a few of the shapes that can promote your business. See our shapes page or call us for ideas and recommendations. Custom gift baskets are another great way to let your clients know that you appreciate their business. We offer a wide range of products along with our delicious, handmade chocolates that your clients will appreciate and remember. We are happy to include your business cards with any basket we create for you.